John Marquis and Alex Kiwomya have hit the ground running as a strike duo, much to the delight of boss Darren Ferguson. They have started two games together, against Fleetwood Town and Rotherham United, and both found the net. 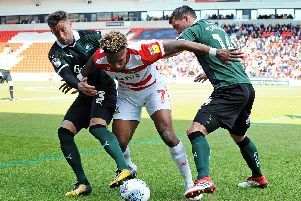 More so, Marquis made Kiwomya’s goal on his first Rovers start and Kiwomya repaid the compliment at the New York Stadium last weekend. And their seemingly instant bond has not gone unnoticed by Ferguson. “The front three [Marquis, Kiwomya and James Coppinger] have been outstanding in the last two games,” said Ferguson. “They’ve looked a real threat and really led the line in terms of pressing, which is what we want. “We’ve done a lot of work on that, putting defenders under pressure, and the goal on Saturday came from that. “I think Kiwomya and Marquis look good. I do, I like them. They’re covering a lot of distance. “And I thought Coppinger was the best player on the pitch by a long way on Saturday, I thought he was outstanding. Rovers’ frontline will fancy their chances of continuing their scoring streak this weekend at home to a Bury side with the worst away record in League One. Andy Boyle (groin) is rated doubtful.